Thus from day one, we've brought along our own booster seat whenever we've eaten out at a restaurant. The one we have though is large and clunky and made entirely of plastic. I knew there had to be a better design for a travel booster seat and I'm glad to report that I've finally found one. The Go Anywhere Booster Seat from A Parent Company looks like a compact and stylish messenger bag, but then unfolds to provide an instant seat for any child up to five years of age. I recently had the chance to review this seat with Riley. Keep reading to learn more! I reviewed the Polar Gear Baby Go Anywhere Booster Seatfrom A Parent Company, which retails for $39.99. 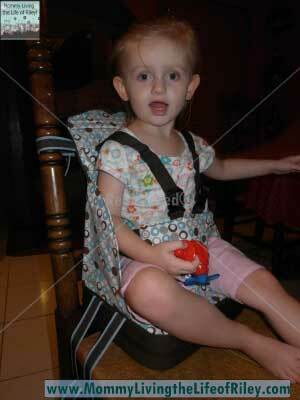 The Go Anywhere Booster Seat is a convenient travel seat for use while dining out in public. It is extremely light, weighing in at around 1 pound, and also very slim. 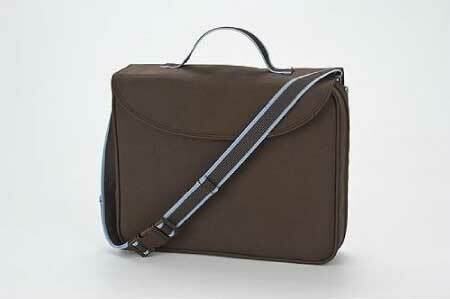 I especially like the brown and blue dotted pattern of this booster seat and love how it folds up so compactly to look just like an ordinary messenger bag. I was always so tired of carrying around our huge, clunky, plastic booster seat, but now with the Go Anywhere Booster Seat, I feel much more put together and stylish when entering a restaurant. The Go Anywhere Booster Seat attaches to most dining chairs via three adjustable nylon straps, one across the back of the chair and two underneath the seat itself. It is also extremely safe to put even young children in, for it utilizes a 5-point harness for extra stability while at the table. Now, whether your child is eating, drinking or just playing, you can rest assured that with the Go Anywhere Booster Seat, they are safe and secure. 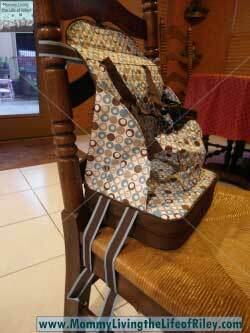 This seat is geared for children weighing just 15 pounds all the way up to 40 pounds or approximately 5 years of age. I love purchasing products that I know we will get years of use out of, and because the Go Anywhere Booster Seat can accommodate such a large age range of children, you will definitely get your money's worth out of this purchase. What's more, this seat is extremely versatile for it can be used at many more places than just a restaurant. 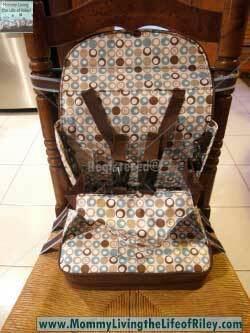 This is the perfect solution for taking to a friend or loved one's home who you know doesn't have a booster seat or high chair of their own. It also is so small and compact that we keep it as a permanent fixture in our family vehicle. Now, we'll never be caught without it and the Go Anywhere Booster Seat isn't a nuisance because it hardly takes up any room at all. But most importantly, Riley found it very comfortable to sit in and loved trying it out! We couldn't even coax her into her normal booster seat at home when it was time to eat dinner! She insisted that she eat in her new Go Anywhere Booster Seat from A Parent Company instead, which was definitely all right with us! If you have a small child or know someone who does, then I highly recommend purchasing the Go Anywhere Booster Seat. Now you won't have to resort to the booster seats the restaurant provides and your child can eat in style no matter where you go. Disclosure: I received the Polar Gear Baby Go Anywhere Booster Seat from A Parent Company in order to facilitate my review. No other compensation was received. This product review is based on my own personal experiences with this item and is completely honest and objective.